I never experimented with Omelette's. I usually prepare plain Omelette's, Sunny side up and this spicy Indian Style Masala Omelette. Ofcourse, there are N number of Egg Omelette varieties. 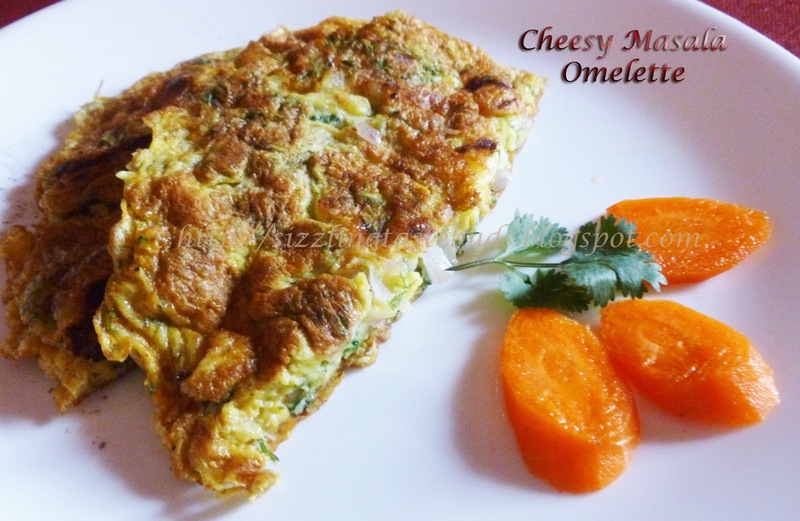 One among those is this Cheesy Egg Omelette's. Introduced this cheesy egg bites to my family and everyone loved it. Eggs never disappoint us in trying out new dishes right? My son who is not that fond of cheese, LOVED IT. 1. Take a mixing bowl and beat the eggs. Add in all the ingredients except oil, cheese and pepper powder. Mix well. 2. Heat the frying pan. Spread 2 tsp of oil and pour this egg mixture to it . Place these finely chopped or grated cheese on top of it and cover it with a lid to cook in a low- medium flame. 3. Check after a minute. Gently flip it and allow it to cook on other side too. 4. Once done, remove it and serve it along with bread and a cup of milk/ tea/ coffee. Cheesy Egg Omelette is ready to be served. Note: Add little less salt than usual, since cheese too contains some bits of salt.